Blood pressure is a measure of how hard the blood pushes against the walls of your arteries as it moves through your body. Your blood pressure naturally goes up and down throughout the day. But if your blood pressure stays up, you have high blood pressure, or hypertension. When blood pressure is high, it causes damage to your blood vessel walls that gets worse over time. This increases your risk for heart disease, stroke, and kidney problems. Having high blood pressure is serious, but there is good news. There are many ways to manage blood pressure. Our topics cover lifestyle changes that can lower blood pressure, such as eating better, being active, and losing weight. You will also learn how to check your blood pressure at home and weigh the pros and cons of taking medicine to lower your blood pressure. 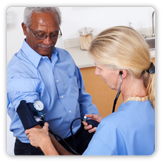 High Blood Pressure: Checking Your Blood Pressure at Home.